Filching an album title from QUEEN's heyday, BLIND GUARDIAN are back in the game and Century Media are expecting them to be a franchise player. With several top ten and top twenty chart placings in European countries (including a #1 ranking in Greece-they sure love thier power metal there), they may be right. Although I appreciate the sweeping scope of BLIND GUARDIAN's music and the profundity of their complex structures, for my money the band is at its best when they let down their hair and just kick out the metal fast and furious. When they rock, they rock so hard and fast that having to wade through all the extras gets tedious at times. 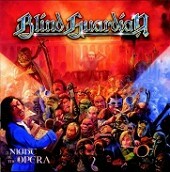 Fans of European power metal are going to be hailing this as a classic and it probably is. It would probably be less so if it were stripped down to the basics but I know I would like it better.